As a result of which the Bhakt community is suffering an infinite loss. Everyone does sadhna opposite to scriptures based on one’s own inference and as directed by the gurus. As a result of which neither do they get mental peace, nor physical comforts, nor get any profit at home or in business. Neither do they meet and see God, nor attain liberation/salvation, and to know that how can one achieve all these comforts and that who am I, from where have I come, why do I take birth, why do I die and why do I suffer?, after all, who is getting all this done and who is the Supreme God (Parmeshwar), how does He look like, where is He, and how will He be attained, and who is the mother and father of Brahma, Vishnu and Shiv, and how can we become free from Kaal Brahm’s jail and go back to our real home (Satlok). All this has been presented by means of a book Message to Devotion's Trader so that by reading it the welfare of a common devout soul can become possible. 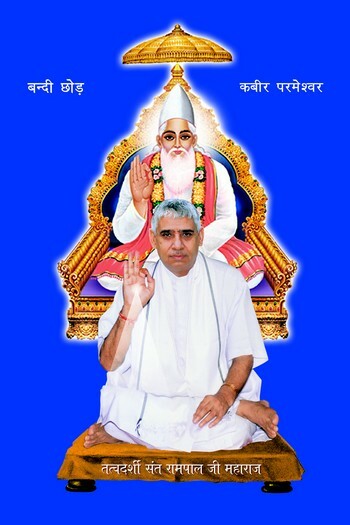 This book is a collection of the discourses of Satguru Rampal Ji Maharaj which is based on facts. We are fully confident that a reader who will read this with interest and in an unbiased manner and will follow it, his welfare is possible. कोटि अध्वमेघ यज्ञ, सकल समाना भौर।।"
Meaning: - If the self-welfare of one soul is brought about by engaging him on the path of true bhakti, then one gets the fruit of crore Ashwamegh yagyas and there is no meritorious act (Dharm) equivalent to that. Kabir Sahib says that this knowledge of mine is such that if one is a knowledgeable person, then on hearing this, will absorb this in his heart, and if someone is foolish, then it is out of his understanding. "कबीर, ज्ञानी हो तो हृदय लगाई, मूर्ख हो तो गम ना पाई"